Mark your calendars! The date has been set for the 8th Annual Walk for Thomas event – taking place on Sunday, September 23! Walk for Thomas is a very special event to CM (Critical Mass) – Thomas Mueller was the son of Di Wilkins and Philip Mueller, and the nephew of Sara and Brett Anhorn. He passed away at the age of seven in 2011 from neuroblastoma, a rare form of childhood cancer. Thomas fought the disease bravely for many years, and Walk for Thomas is held each year to honour his memory, and support research into finding a cure for neuroblastoma. Walk for Thomas takes place at Queen Elizabeth School in West Hillhurst (402 – 18th Street N.W. ), and includes a ton of fun activities – a 3 km walk through the community, crafts for kids, a silent auction and BBQ lunch. It’s a great opportunity to celebrate Thomas’ memory, enjoy a fall morning with your fellow CMers, and support this special event. The walk wouldn’t be possible without amazing volunteers – if you want to get involved and volunteer, we’ll share more information soon on what we’re looking for and how you can help. Save the date and we look forward to seeing you September 23! The date has been set for the 7th Annual Walk for Thomas event ­ please keep the morning of Sunday September 24th open! Watch our site and Facebook page for more event details and updates. 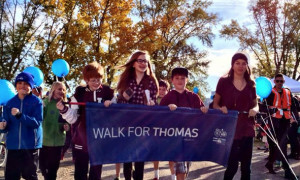 All of the funds raised at the Walk for Thomas go directly to the Alberta Children¹s Hospital Foundation ­ and in particular the Thomas Mueller Phage Display Project. This project is led by the lab of Dr. Paul Beaudry at the University of Calgary and is exploring new approaches to improve the diagnostics and therapeutic options for children with high risk neuroblastoma. This amazing event would not be possible without some equally amazing volunteers and event sponsors. If you are interested in being a part of our volunteer team this year, we would love to have your support!! Be it guiding walkers on the route, working at the merchandise and donations table, posting LIVE from the event on our social channels or even flipping burgers with the crew – there are so many different ways to get involved! For more info or to donate your time, please contact Franca Shulte. For general questions and inquiries regarding the walk, please contact Julie Walyuchow. Hope to see many of you at the walk in September! WALK FOR THOMAS | DR. PAUL BEAUDRY from Human Impact Stories on Vimeo. The date has been set for the 6th Annual Walk for Thomas event – please keep the morning of Sunday September 25th, 2016 open! All of the funds raised at the Walk for Thomas go directly to the Alberta Children’s Hospital Foundation – and in particular the Thomas Mueller Phage Display Project. This project is led by the lab of Dr. Paul Beaudry at the University of Calgary and is exploring new approaches to improve the diagnostics and therapeutic options for children with high risk neuroblastoma. On September 30th, 2011, Thomas Mueller, passed away from a rare form of childhood cancer called neuroblastoma. Thomas was only 7 years old and he fought this disease with vigour and bravery for most of his young life. Walkers are made up of Thomas’ former school mates, neighbourhood friends, and his family and relatives. The Walk is a great tribute to Thomas and his family – we hope to see you there. The 5th Annual Walk for Thomas will take place on Sunday, September 27th. The walk will be held once again at Queen Elizabeth School in West Hillhurst, Calgary. Please join us at 9:30 a.m. for refreshments or join us for the start of the walk at 10 a.m. followed by a BBQ at 11 a.m.
We were overwhelmed by the generous outpouring of participants last year and are looking forward to another great walk in memory of an exceptional boy. Donations can be made through our website and if you would like to participate as a volunteer, please contact Julie Walyuchow at juliew@criticalmass.com. We are only a few days away from our 5th Annual Walk for Thomas! In the coming days we will be posting neuroblastoma facts and figures on our social media to help inform all of our followers and update you on current research. We look forward to remembering an incredible boy on September 27 and coming together to raise awareness so that this disease will no longer affect our future generations. See you soon! 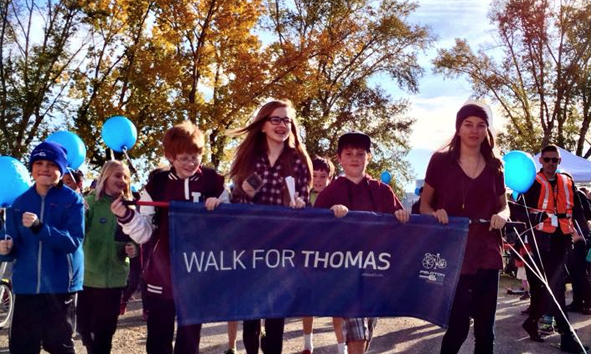 On September 27th, 2015, we will be holding our 5th Annual Walk for Thomas in Calgary, Alberta. The Walk for Thomas unites friends and family of Thomas Mueller in the fight against a rare form of childhood cancer called neuroblastoma. Thomas fought this disease with courage and bravery for most of his young life and passed away on September 30th, 2011 – he was 7 years old. To remember Thomas and to raise awareness and funds for neuroblastoma research, we invite you to join us at the Walk for Thomas. We hope to see you this year! Stunning work, Chantelle! Thank you so much for making such a beautiful video! Walk for THOMAS 2014 from Chantelle Kolesnik on Vimeo. Your neighbour and mine Thomas Mueller was diagnosed while he was still three and he was seven years old when he lost his fight September 30, 2011. I will never forget the moment I had to tell that news to my own boy and our tears as we drove to hockey practice not knowing what to do except going about our lives and pretending that everything was still the same. Time passes and you get over certain things. And I need to tell you that every fall a couple of things happen to prove that his spirit is alive and well. First off his school stages a Terry Fox Run every September, and, three years later, the Grade 5/6s are still writing on their stickers that they are running for Thomas. Thomas was an exceptionally high-energy boy and I think all those mentions of him rouse his spirit in all of us. Then, about a week ago, as I was out for a run myself, all these pictures of him began to enter my head. It happened up on Crescent Heights and it was like he was right alongside me, and I realized I was crying while I was running. As we jogged, he pointed out his alternative future – what it would have been like had he beaten neuroblastoma. • He might be in Amy Ward’s Gr 5/6 class at the school, alongside all his pals. • He would have built a robotics collection and love it just as much as his Lego now. • He would be big into karate, or minor hockey, he’s Atom age now, he would have been getting a lot bigger as he left neuroblastoma in the dust and he would be wanting them to let bodychecking back in because he so loves the physical stuff. • He wouldn’t even have to tell me he’d be into Minecraft and playing a lot of XBOX til 2 in the morning on sleepovers with his friends. • He would NOT YET have any interest in kissing a girl! o Go to medical school and then help Dr. Beaudry find a cure for all the rest of these childhood cancers. o Marry a girl who is just as beautiful (but maybe not quite as crazy) as his sister. o Have his own kids and eventually grandkids and love them as much as Phil and Di love him. For Thomas and for ourselves, now it’s time to seize that brighter day: let’s stand tall and walk strong. We would like to send out our most heartfelt thank you’s to all of the sponsors, volunteers and participants who made the fourth annual Walk for Thomas such a success. The Thomas Mueller Phage Display Project is made possible by all of you and we are so thankful you have joined us on the road to find a cure.